The devices currently in development through DADSS take blood alcohol detection to the next level by measuring a person’s BAC seamlessly and in the background, rather than by purposeful testing. When installed in a motor vehicle, the device will be able to detect when a prospective driver’s BAC exceeds the legal limit and will automatically disable the ignition so the vehicle won’t start. 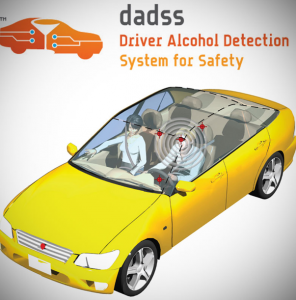 DADSS is currently exploring two possible types of BAC detection systems for motor vehicles, both of which show significant promise. Operating under a similar principle as the breathalyzer, a breath-based device would analyze the driver’s breath as he enters the vehicle, measuring both alcohol and carbon dioxide molecules to determine the dilution of alcohol. If the BAC from the driver’s breath exceeds 0.08 (the legal limit of intoxication in most states), the ignition lock engages. Another technology being explored would measure BAC through the skin. The detectors would be installed in a surface the driver naturally touches, such as an ignition button. The sensor would use infrared light to detect the presence of alcohol in the capillaries of the driver’s finger and deliver results in less than a second. If the BAC is too high, the car simply won’t start. How Is This Technology Different from Ignition Interlock? 1. Ignition interlock is active, while DADSS technology is passive. The interlock devices of today include a built-in breathalyzer that the driver must actively use before starting up the vehicle. It is intrusive—some might say even humiliating. Conversely, DADSS technology would operate in the background, naturally detecting BAC levels without the driver having to activate anything. 2. Ignition interlock is punitive; DADSS is preventive. By contrast, DADSS developers hope their devices will eventually come standard in all newly manufactured vehicles, effectively making those vehicles DUI-proof for any intoxicated driver who attempts to get behind the wheel. In this way, DADSS could prevent even a first DUI—not just a second or third one. While we have reason to be excited about the progress, DADSS technology still has a long road to travel before it’s ready for market. According to CNET, the new technology still faces a number of hurdles on various fronts. What are some of these hurdles? Developers and researchers must address the many variables that could possibly cause a detection device to produce a false reading or misinterpret other data, allowing an impaired driver to start the car. For the device to work effectively, it must be able to accommodate the various ways alcohol affects different body types and ethnicities, as well as be able to detect subtle changes in BAC caused by “last call” gulps and last-minute snacking. Despite a general public consensus that driving under the influence is a threat to public safety, there are still special interest groups that may resist these preventative efforts using the argument that they are intrusive. For example, the American Beverage Institute (the bar and restaurant industry lobby), has already opposed the ignition interlock requirement for first-time DUI offenders unless their BAC is over 0.15. Any attempt to increase detection standards would likely face opposition from such lobbies because they could be seen as a deterrent to drinking in general, hurting the liquor industry’s bottom line. Then there is the greater question of how much control we reasonably exert over one another as humans. As distasteful as we may find it that someone would drive intoxicated (and legal limits aside), does it cross an ethical line to remove someone else’s ability to determine for themselves how much is “too much?” By designing our cars to effectively “refuse service” to someone based on their breath, could we be jeopardizing other freedoms in the name of public safety? Of course, these questions arise almost every time a new regulation or protection is enforced—some may even remember a similar debate over making seatbelts a legal requirement—so as the Driver Alcohol Detection System for Safety draws closer to releasing its technology, it will no doubt spark some interesting conversations. If the developers have their way, however, these advancements could make the roadways much safer overall. In time, DUI could even become a thing of the past.